First, make the cucumber-jalapeno pickles by combining the rice vinegar and sugar in a small bowl and stirring until the sugar is dissolved. Add the cucumber and jalapeño slices, stir to combine and season to taste with salt. Transfer to a serving dish. brown sugar, soy sauce, lime juice and sriracha in a saucepan over low heat. Cook, stirring frequently, until the sugar has dissolved, then add the pork and heat through. Set aside. cucumber-jalapeño pickles in the center of each tortilla. 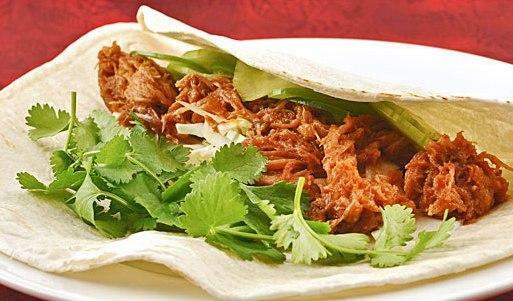 Top with the pulled pork and fresh cilantro and serve with wedges of lime.